Quick update: The Arena landing is open for business again! Any trips that were scheduled for Arena are now operating normally. Mazomanie landing is also now accessible via Hwy 78 to Cty Y (~5 minutes further than going through town from Spring Green). We are now planning to use Mazomanie launch starting Friday. 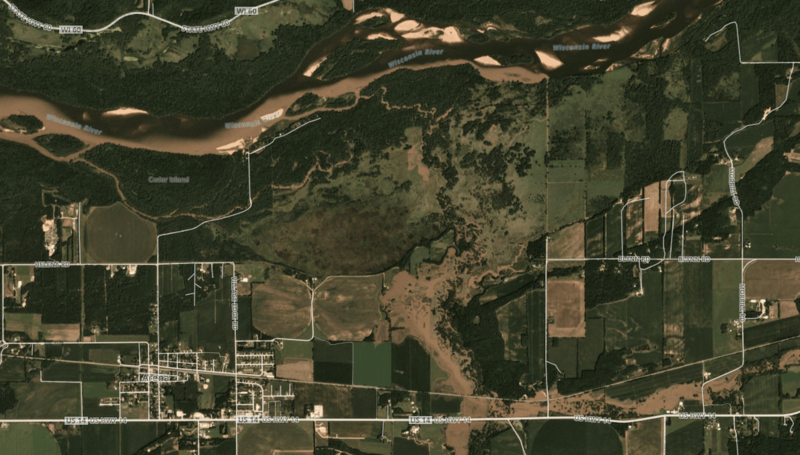 ===== Still waiting for water to drain off of the roads but in the meantime, these satellite photos of the river are from 11am yesterday. Black Earth Creek has overtaken the floodplain and is flowing into the Wisconsin River over the course of 3 miles. While out on the water, it'll be immediately apparent when you come across flood waters. First off - the Wisconsin River is 100% unaffected by the flooding nearby. Well, 85% unaffected would be more accurate. The majority of the rainfall was in the Rock and Sugar River watersheds. Only a relatively minor tributary of the Wisconsin (Black Earth Creek) is affected. While this creek peaked at several thousand CFS, it is now quickly dropping through 600 CFS on it's way to a normal 50 CFS. 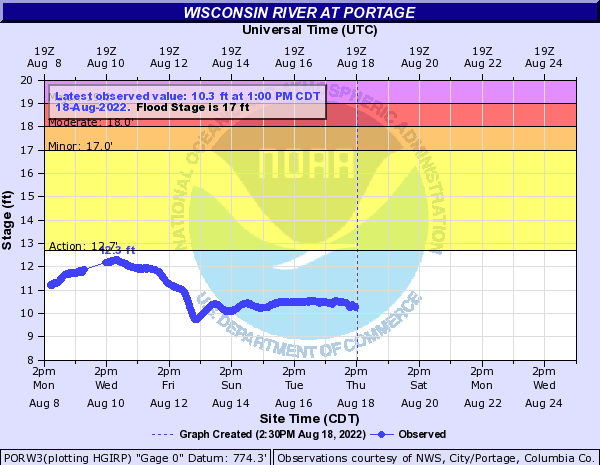 To put this in perspective, the Wisconsin River is currently running at 7,000 cfs (normal late summer levels, i.e. low) and wouldn't affect sandbars until 15,000 CFS. Black Earth Creek enters the Wisconsin below Arena and would only contribute to water levels on the last 8 miles of your trip. Not completely irrelevant, but mostly. Road closures are where this has caused some real headaches that we've never actually had to deal with before. Right this minute we're unable to use anything on the south side of the river as Hwy 14 is the main thoroughfare and has been shut down. Our access to the Arena boat landing has been hit and miss over the past 24 hours but I suspect it'll be out of the picture for a few days as the road to the landing goes right over Black Earth Creek (or more accurately, under Black Earth Creek right now). 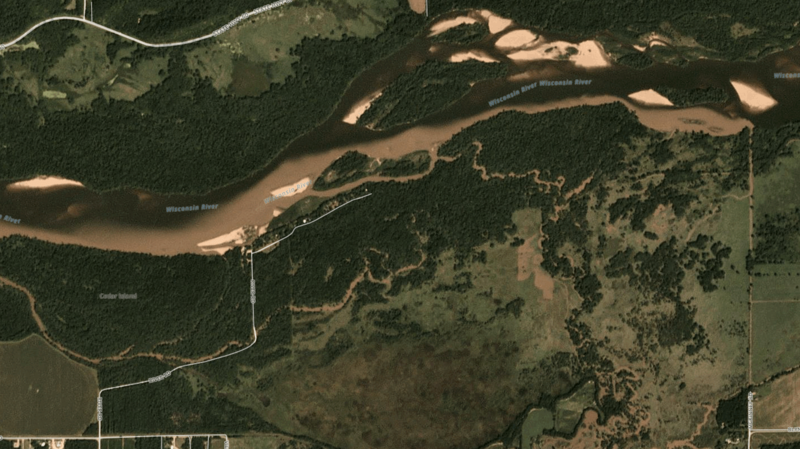 The Mazomanie landing is technically accessible via the long way around the river but that detour is substantial and will also be trouble for anyone trying to drop off gear ahead of time. Prairie Du Sac is operating as normal. For now, we've made alternative arrangements for groups going out through Thursday. If your trip starts Friday or Saturday, check back here for updates sometime tomorrow afternoon. We'll also send out a text message/email update with any official adjustments in launch points. For now, here's what we're expecting to do for the following trips: Prairie Du Sac/VFW - nothing has changed Mazomanie - expect to use the Sauk-Prairie Canoe Launch across the river (but right off of the Hwy 14 detour) - https://goo.gl/maps/VKnPqZGJu2y - the trip adds a mile by river (17 miles total) and there's a lot of sand from the parking lot to the river but it's better than nothing. If you don't want to drag your boats, you may want to consider switching to the 25 mile PDS trip. Arena - if you're going overnight, consider taking a longer trip out of the Sauk-Prairie launch. If a day trip, you'll likely have to put on at Hwy 14 for a very short 2 miles and/or paddle upstream to the railroad bridge or into Tower Hill State Park to add some time. Either way, this will be a short trip if we can't get into the Arena landing. You're also welcome to cancel the trip entirely for a full refund (not a bad option given the weather outlook for Friday). Hopefully by Saturday the creek will have dropped enough to get us back over the bridge into the Arena landing. No word on how long it'll take to fix the approach but for the foreseeable future, plan to get to Spring Green via Hwy 12/60 through Sauk City or Hwy 151/23 through Dodgeville. Hwy 14 is out. ===== Quick update: I forgot we still have to be able to get you on the river once you get to us. Currently our only accessible landing is PDS. Mazomanie looks to be out of the picture for at least a day or two. Arena may or may not be accessible in the next few hours. We’ve made backup plans with the trips going out today and will update if we need to move everyone to alternate landings through the rest of the week via text/email. Hwy 14 is completely impassable between Black Earth and the entire town of Mazomanie. 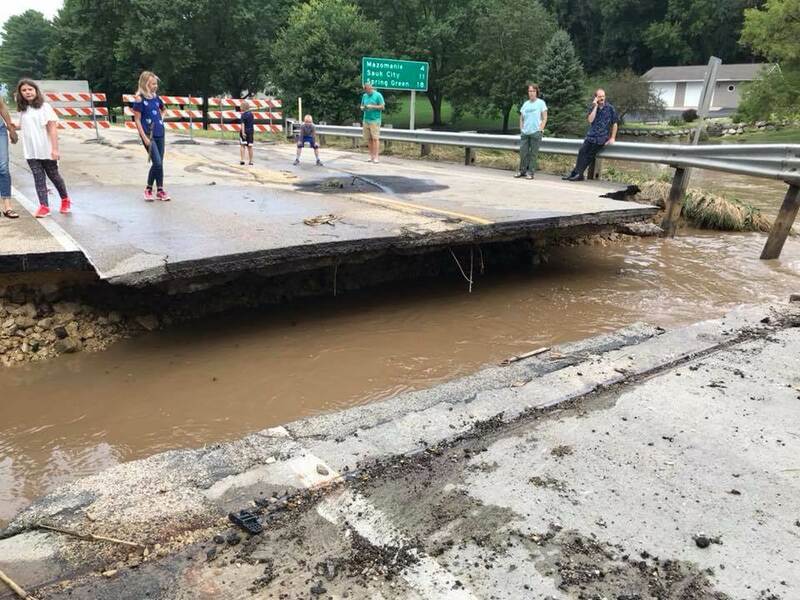 -Ryan ====== Last night brought record breaking rains to the area between Spring Green and Madison – up to 13″ in a matter of hours. One of the tributaries of the Wisconsin, Black Earth Creek, peaked at it’s highest level in recorded history. Actually, that’s an assumption at this point since the water is so high it’s gone above and beyond what the USGS gauge can measure. Luckily for us, this rain was fairly localized and will not affect the Wisconsin River or it’s sandbars beyond a temporary 6-12″ of water rise and we’ve got plenty of capacity to handle that so no need to worry about trips being cancelled. What may be tricky is the road closures between us and Madison. The majority of you would be traveling down Hwy 14 however it’s currently closed in a number of places. I’ve heard rumors of at least one washed out bridge but it hasn’t been confirmed. Mostly there are trees and standing water so I’m optimistic the highway will be open at least by this weekend if not later today (pending something catastrophic like a bridge out). For now, I’d recommend keeping an eye on 511WI.org for up to minute updates. If Hwy 14 is still closed, you can head south on 151 out of Madison through Verona and Dodgeville, then up Hwy 23 to the landing (shouldn’t add more than 10 minutes to the drive).